When a dog is bitten by another dog, we may only be able to see small puncture wounds from the outside. However, when dogs bite, their canine teeth puncture through the skin, while their other teeth cause crushing injury. Many dogs will also shake or struggle, leading to tearing injuries as well. These severe wounds, combined with the bacteria in a dogs’ mouth, can quickly lead to life threatening conditions. An unfortunate example of this is Harris. 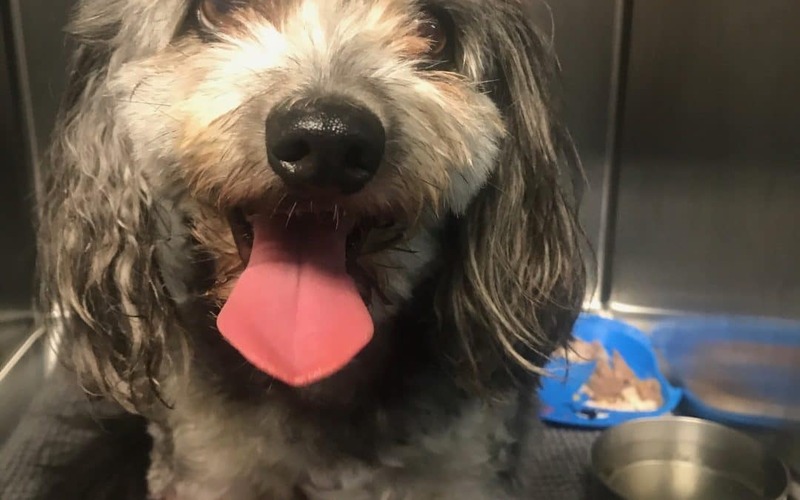 Harris, a handsome 6-year-old Poodle Cross, was being walked on a lead by his family when another dog playing ball ran up and bit him on the back. At first Harris’ owners couldn’t find any wounds or bleeding due to his long hairy coat, but he was in obvious pain so they rushed him down to Animal Emergency Service in Tanawha. Harris was taken out the back by the veterinary team and given pain relief and oxygen immediately. The veterinary team clipped his coat and found several tooth puncture wounds, with one life-threatening wound over the ribs. 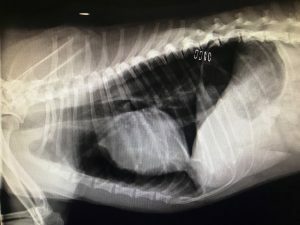 The dog’s tooth had managed to puncture the chest cavity, causing so much damage that several ribs were broken and his lungs were visible through the wound. Harris was breathing through this wound in his chest and as a result, he was unable to get enough oxygen into his blood and was at high risk for going into respiratory failure. Harris was stabilised with oxygen and intravenous fluids, before being rushed into lifesaving emergency surgery. An emergency thoracotomy performed by Dr. Danielle H and Dr. Danielle M found significant damage to the muscles overlaying the ribs, along with several broken ribs. The broken ribs had also penetrated through the diaphragm which is a thin muscle layer that separates the lungs and heart from the abdominal organs. Through this hole, Harris’ stomach was visible! After this hole was repaired, Harris’ lungs were checked for damage and his chest cavity was thoroughly cleaned to reduce the chance of infection. A chest tube was placed, which allows blood, air and other fluids to be suctioned off the chest once the surgery is complete. Harris then underwent an exploratory laparotomy to ensure the ribs did not puncture a hole in the stomach or liver. Thankfully, apart from the diaphragm, there was no damage to Harris’ abdominal organs. Harris had several other small puncture wounds which were all cleaned and sutured closed. Harris woke up from his surgery smoothly and was kept in hospital for the next few days for monitoring. Within a day, Harris was able to oxygenate well on his own and there was no fluid build up in his chest, which meant his chest tube could be removed earlier than expected. Harris recovered in leaps and bounds, and was able to go home with his dedicated and loving owners only three days after his surgery. What a trooper! So remember, although it may only seem like a small wound on the surface, it’s what might be lurking beneath that is the real danger. For any dog fight wound, seemingly big OR small, Animal Emergency Service always recommend taking your pet to your nearest veterinarian immediately.